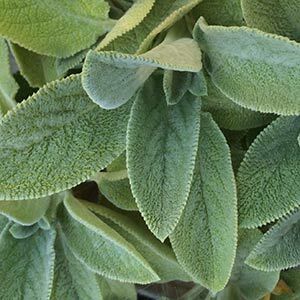 It is both Stachys byzantina and Stachys macrantha along with a few other species that are often called Lamb’s Ears and make great ground cover plants. The species offered by most wholesale growers is Stachys byzantina, commonly in 14cm pots however also as tube stock for larger planting schemes. Excellent for mass planting and very popular in home gardens as well. Appreciated for the texture that they provide in gardens. Suited for revegetation projects as well as for replanting in established gardens. The main landscaping attraction is the grey green soft velvety foliage that gives the plant its common name. Used widely as a ground cover plant, as a low edging plant next to paths and at the front of the perennial border as well as for underplanting taller shrubs in containers. Stachys byzantina will spread by rhizomes and is an easy care plant once established. Flowering period is in mid summer to autumn. Flower colour will vary from pink to a deeper pink/purple. Grows well in dry conditions once established. Not well suited to very humid climates. Stachys byzantina Plants are sometimes offered as Stachys lantana. Should also be considered for commercial plantings where conditions are suitable as they are low care once established.